Great location, breakfast is good (bagels, cereals, differentbpastries, etc), the street is packed with restaurants, a 7-11 across the street. It might look a bit old, and could use some renovations, but it is s good place to stay at nevertheless. 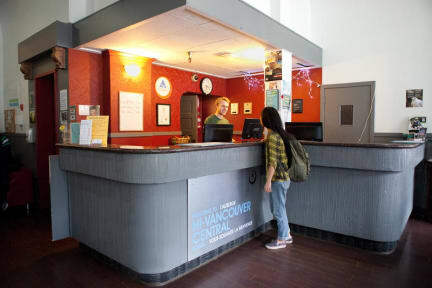 The best hostel in Vancouver, clean, with a nice location, there are a lot of places close there, facilities are the best! HI Vancouver is a great place to stay. It is in the heart of the city. Everything is easily accessible. You can walk around to get stores and restaurants. There is also a bus stop in front of the hostel making it easy to hop on and off the metro. The staff are really nice but are not wuite knowledgeable about the city. Asked 3 different staff about their recommendations and couldnt even give a decent one. But overall, its worth every penny staying here if you want to save. Right in the middle of it all. Super clean. Also had the best free breakfast I've ever seen. Great option if you want to stay downtown. A bit run down, but great location. No more than a max of about 25 minutes walking to everything downtown. Keep in mind that it is on Granville, so it can be loud because it is a bar street. Some washrooms were out of order, but not a big deal. The adjustment knob on the heater in my room (316) wouldn't turn so it was very hot unless I opened the window. The location was great if you wanted to get in on the nightlife action. The facility was clean and the staff was nice. A good free breakfast, the staff were nice and the bed was comfortable. A little bit expensive and not really connect with other travellers type hostel atmosphere, but good place for a night before flying the next day and I liked my stay. Everything is nice, staffs are friendly. Just one comment about the water heating system, hot water seems not working during the entire period of stay. went just for a night for work. Place was good. Has option of just sharing with 1 other person which is great, no sharing with 4-7 other people. The only thing I would say was how hot the room was at night. Couldn't get it to cool down and the heat wasn't even on. Was on the the top floor though so make sense since hot air rises.